Sandy was the sweetest, dog. A mild tempered German Shepherd, she developed DM at age 8. We kept her with us until she was ready to leave us. We never could put her down. SOme call that mean, but she was happy until the end and never in pain. We made her a wheelchair, and she loved to get in it and go for a walk. She was a fighter and kept strong, playing and walking on her two front legs up to the last minute. Then, when we had to leave the house for a few days to attend a funeral of my father-in-law, she left us too. She must not have wanted us to see her go. Rest in Peace my girl. You will be missed terribly. We will see you at the rainbow bridge, where we will meet again and be together for eternity. Karen, I am so very sorry for the loss of your beloved German Shepherd, Sandy - it is a shame you didn’t get the chance to have more time together with her. And thank you so much for sharing your memories with us all here. And to all our visitors here at Total German Shepherd, thanks so much for reading the story of Sandy and please come back often to see what else is going on in our growing German Shepherd community. If you get a chance please let us know what you think about the above story by leaving some comments below. It's very to do - all you have to do is just click on the link that says "Click here to post comments" - and if you want to read what others have said too, you can do that too at the same place. And if you get the chance please leave some feedback, place a video of your own or tell us your own German Shepherd story in our sharing section. 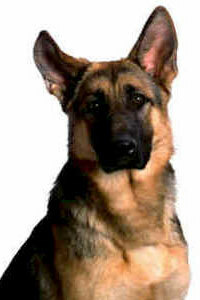 And come back often as things will change daily here at Total German Shepherd.